Have the limits of the avocado market been reached? With the large volumes, shipped mainly by Peru and South Africa, Europe and the US feel that there may be some oversupply. Traders reports that prices are under pressure. June may offer some relief. This month has been declared World Avocado Month. The exotic is being promoted worldwide. The mood remains good in the production countries. The acreage and production are growing and new export markets, especially in Asia, are being opened. Only in South Africa are exporters somewhat concerned about the threat of a surplus in Europe. The sector is slowing down the pace of exports to alleviate the impact of the clash with Peru. This year, a record 3.2 million tonnes of avocados are being harvested worldwide. Mexico remains the largest producer, with almost 1.9 million tonnes (60%) of the total. Other major producers of Hass avocados are Peru (13%), Chile (7%), California (5%), South Africa (4%), Colombia (3%), Israel (3%), Australia (2% ) and Spain (1%). According to the statistics, the acreage stands at 361,000 hectares worldwide. Production continues to grow in Peru, Colombia and South Africa. Meanwhile, drought prevents further growth in countries such as Chile, Spain, California and Israel. Brazil and Kenya still have plenty of room for growth. Also, new production countries are emerging, such as Guatemala, Morocco, the Philippines, China and India. In South America, Colombia, Brazil, Peru, Chile and Argentina are the largest producers. Chile has a well-developed industry, but Peru is the largest exporter. The country exports 60% of the production. Colombia is the rising star. The main destinations are Europe and the US, even though there is competition from Mexico in the latter. Chile and Peru have recently gained access to the Asian market, where the sector is growing. Regardless of how the relationship with the US develops, Mexican exporters are confident about the possibility of sales growing in other markets. The fact is that the sector fears the consequences of a trade war. If the US set tariffs on the import of the "green gold", more exporters will be motivated to seek alternative markets. This could result in competition between the different growing areas in Mexico. One of the destinations which has attracted the most attention from exporters is China, where consumption is growing rapidly. In 2014, China imported 400 tonnes of Mexican avocados (all from Michoacán), and in 2017, that figure had increased to 14,000 tonnes. Growers in the Jalisco region have been focusing on the global market for some time. Last year, that region exported 90,000 tonnes to 20 countries. An export volume totalling 110,000 tonnes is expected for this year. Canada, France, Spain, the Netherlands, the UK, Belgium and Japan are currently the most important export markets. Thanks to the CPTPP or TPP-11 trade agreement (in full: The Broad and Progressive Agreement of the Trans-Pacific Partnership), exporters have set their sights on Australia and New Zealand. The two countries are major producers in the region, but also have seasonal restrictions combined with a growing demand. That is why exporters see opportunities in those markets. These countries are difficult to access because of phytosanitary requirements, but the negotiations for the necessary protocols are ongoing. Japan is another big market in Asia and Singapore is also attractive. Is Colombia becoming the second largest Hass producer? The South American country has the potential to become the second largest producer of Hass avocados in the world. The country expects to achieve that within ten years if the growth rate of both acreage and production remain stable. Every year, between 1,500 and 2,000 hectares are planted. In total, the country has 15,000 hectares devoted to the fruit. Antioquia, Caldas and Tolima are the largest production regions, but the largest growth is recorded in the Valley and neighbouring regions, such as Cauca, Huila and Putmayo. The US already opened its borders to Colombian avocados, so more and more exporters started to focus on this market. 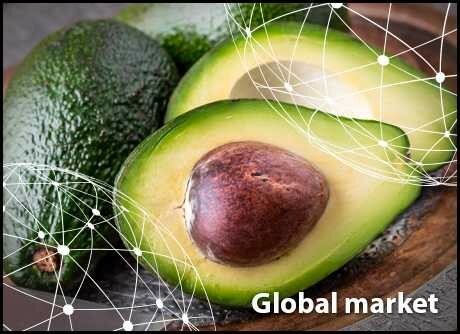 Exports are growing quickly and avocados are well on the way to reaching the top of the ranking of major export products. Companies continue to invest in avocados. At the end of 2017, for example, a company invested in an optical sorting machine to optimise the process. The sector is focusing both on the development of the domestic market and on exports. The largest cultivation company in the country harvested about 7,000 tonnes last year. Honduras has ​​560 hectares planted with several avocado varieties, so it is not at the top of any rankings. With an acreage totalling ​​5,000 hectares, there would at least be enough production to meet the domestic demand. For the surplus production, neighbouring countries, as well as Europe and Asia, are mentioned as possible export markets. Chile: "There is no reason for the high prices"
The delayed supply from Peru has pushed prices up in Chile. The Chilean season lasts from August to April, after which the market also relies on imports. The higher prices, however, are not justifiable, according to a grower. "I'm not getting such a high price, but if you buy in the supermarket, it looks like I am." The price is expected to fall again with the start of the new season. The prospects for the new season are good, with a volume expected to reach 245,000 tonnes. The weather this spring was ideal for the fruit's development. There are some differences between regions. For example, Valparaiso didn't have as good a harvest, but that loss is compensated by the results of other growing areas. When it comes to exports, the country needs to take Peru into account, as its season is expected to last longer this year. This means that Chile could start exporting later, but according to a trader, the quality of the fruit will benefit from this. The season lasts from April to September. This means that the country is on the market during the period when Mexico has less production available. The country plays an important role in the supply of the exotic fruit on various continents. Europe consumed about 463,000 tonnes in 2017, 33% of which was supplied by Peru. This made the country the most important supplier, followed by Chile (22%), South Africa (9%) and Israel (14%). Consumption will be even higher this year and Peru's share will also increase. In the US, Peru plays a smaller role as the third largest trading partner, behind Mexico (79%) and California (9%). Peru has a 6% share of the market, which corresponds to 64,285 tonnes. Avocados are grown all year round on the Caribbean island. There are 20 different varieties available. The Dominican Republic is the second largest producer of avocados, but a large part remains on the domestic market. The country ranks eighth in the list of largest exporters. More than 300,000 tonnes of avocados are harvested on ​​32,000 hectares. Every year, production grows by 10%. Because of the worldwide competition, growers are more likely to choose different varieties. In addition to the Hass, for example, investments are being made in the Maluma and the Mega Hass. These varieties have been planted in a number of regions of the country. In this way, growers try to stand out from the rest. Some 23,000 kilos of Mexican avocados were recently stopped at the border with Costa Rica. According to the authorities of the Central American country, the accompanying certification was not valid. In February, the country changed the rules for three countries that have been boycotted since 2015. For these countries, three options were given to continue to be able to export the avocados. Including a certificate that confirms that the fruit is not carrying sunspot is one of them. According to Costa Rica, the certificate was not accepted because it was issued by an unauthorised authority. Mexico claims the opposite. After a great volume was exported early in the season, partly due to the fact that Peru hit the market later, the sector is currently slowing down the pace of shipments to Europe. Peruvian exports are meeting the demand in Europe. The South American country exports about four times more than South Africa. Some South African exporters want to increase the volume in the next four to five weeks. The Hass usually gets a better price than the green-skinned. About half of the green-skinned avocados on the European market come from South Africa. This year, a harvest of 72,000 tonnes is expected. Growers are satisfied with both quality and sizes. The acreage has been expanded by about 1,000 hectares this year. Netherlands: Hass avocado market under pressure. Will avocado month bring a revival? At the moment, conditions in the green-skinned avocado market remain reasonably stable. There was a large supply of small sizes from Kenya and South Africa, which led to falling prices for the small sizes, but the situation has now become normal again. The large sizes, however, were scarce and therefore more expensive. The supply of large sizes from South Africa is expected to increase, namely for the Fuerte and Ryans varieties. The Hass avocado market is currently under pressure. Large volumes are arriving from Peru and South Africa, and the small sizes in particular are not doing well. The prices for small Hass avocados are at a very low level. Hopefully, the above situation will change, because the World Avocado Organization has declared June "Avocado month". As a result, several retailers are organising large-scale marketing campaigns. The supply of avocados is currently very high. Large volumes are arriving from Peru and South Africa. These countries have had a bumper crop in an on-year, and this guarantees very large volumes. As a result of the great supply, prices are very low compared to last year. June is a promotional month for avocados, mostly due to the low prices. The Hass is the most consumed avocado in Belgium. There is practically no consumption of green-skinned varieties. In Germany, June is also being devoted to avocados and various promotional actions are being prepared. The German market absorbs about 510 million kilos. Also, the market is growing by 22%, making Germany the fastest growing market in Europe. An importer says that many avocados are in stock and sales are declining. Due to the great import volume, prices are under pressure. At the moment, the demand for avocados is smaller than the supply from Peru, which is an important supplier, together with South Africa. The demand for avocados continues to grow. As a result, a trader was able to import directly from the production countries for the first time this year. Before this, the fruit was imported via the Netherlands. In recent years, the market has been recording double digit growth figures. The ready-to-eat market is however still under development. "Consumers prefer to buy the fruit unripe, which is a shame, because our supplier has offered us air-shipped ready-to-eat avocados," says a trader. "But it is still too early for many consumers to buy those products." Up until week 18, the prices were high, with a good quality and supply from Peru. Since then, prices have dropped by 40% and Kenya has also hit the market. The supermarkets, however, are still paying a good price of around 9 Euro per kilo, and prices are expected to rise again. Between 2007 and 2016, the exotic fruits market grew exponentially. The market for avocados grew by as much as 150%. Spain and southern Italy, saw the introduction of the fruit's cultivation. The increased availability and the shorter transport time made it possible for consumption to grow further. Moreover, avocados have benefited from healthy eating trends. Nevertheless, the market still offers plenty of room for growth, also in Italy. With 260 hectares, Italy is the third largest producer in Europe, only behind Spain (10,000 hectares) and Greece (1,000 hectares). Almost the entire Italian acreage (200 hectares) can be found in Sicily. The season on the island has already finished. The harvest kicks off in mid-November and lasts until March/April. Here, too, the Hass is the flagship variety. A grower says that the demand continues to rise and that avocado consumption is not just a trend. "The demand is greater than the supply, and it is also growing faster than the pace at which we are able to expand." According to the grower, the consumer is also interested in the fruit's health properties and is not just attracted by colourful packaging. Over the last three years, e-commerce has become important for avocados in Italy. A grower says that he has sold more outside of Italy in the past two years than on the domestic market. "At the wholesale level, we sold more in France than in Italy." For the catering industry, Italy is the largest market. The new season starts in October and the prospects are good for the time being. "It is another good year with the trees full of fruit." The season came to a close in April; afterwards, traders made the switch to the import of, for example, South African Pinkerton avocados. The new season will start in October. Currently, there is a large supply, which means prices are under pressure. According to a trader, the demand at this time of the year always drops until Greek avocados become available again. The last Spanish avocados were sold a month ago at a price at origin of 3.40 Euro per kilo. At the moment, imports are available, especially from Peru. That country dominates the European market after the end of the South African season. "The large supply from Peru, which has harvested 20% more this year, in combination with the arrival of shipments from South Africa, Kenya and Colombia, resulted in a surplus since May," says a trader. In the coming weeks, the supply will fall, as the seasons in South Africa and Colombia are ending. The trader is happy that the Peruvian harvest was delayed this year and that the country also sees opportunities in Asia and Chile. Most European avocados are grown in Spain. The country has 10,000 hectares devoted to avocado cultivation, with a yield of 6,000 tonnes per hectare. About 12% of those crops are in the Canary Islands. The main production area is La Axarquía, in Malaga. The acreage there cannot expand further due to water shortages and the extremely high prices for the last plots of land. As a result, the acreage is expanding in Valencia, Cadiz and Portugal. The first trees were also planted in Huelva. Other Spanish companies have created subsidiaries in Peru to be able to guarantee a year-round supply. The US market is approaching a transitional period. Currently, the last avocados of the Mexican harvest in March are on the market. "Many avocados I see now are darker," says a trader. "They have hung longer on the tree, so they have to be sold." Traders have no complaints about the supply. Mexico has had a good harvest this year. Another trader is not as happy with the Mexican product. "The fruit should have been picked a month ago; the avocados are ripe and have a lot of oil." According to the trader, this also has to do with the big harvest this year. Some growers are struggling to harvest their large productions. The market has therefore become cautious, since other countries are also on the market. "I don't know for how long can Mexico keep going; the question is whether they will take the volumes coming from Peru and California into account," explains an importer. He says that he has sold over 22 million kilos per week this year. The question is for how long will the market manage to handle such a large volume. The season in California is also going well. So far, less than half of the harvest has been completed. A trader expects about 6 to 7 million kilos (13-15 million lbs) to be supplied by the state every week. Besides, the season in Peru had started and the first volumes have already been shipped to the US. Many of these volumes have been sold to retailers under contracts, but the South American country will continue to play a role in the market until August. The combination of all these factors is putting the prices under pressure. It all depends on the supply, argues a trader. If it is possible to keep the supply in balance, prices of around 30 dollars are possible. But if the market continues to be flooded with more than 22 million kilos per week, the pressure on prices may become even tougher. The sector has just made the switch from the Shepard to the Hass avocado season. The Western States will follow in the coming weeks. According to the trade association, consumption has grown to 3.5 kilos per capita per year. Growers want the market to grow even further, with better quality and new sales areas. According to a trader, a lot of high quality fruit will hit the market in the coming months. Some regions have plenty of large sizes available. Due to the large supply of the fruit, prices are under pressure. According to a grower, they have not been this low in five years. Having gained access to Japan is a welcome step. The Australian Hass will now also be shipped to this country. If production continues to grow at the same rate, more markets will be needed in the future. The demand for avocados is growing and competition in that market is getting tougher. Chile and Mexico, which are China's two most important suppliers, compete with one another. In March of this year, Mexico predicted that China will demand a greater volume than the US within the next ten years. Peru doubled its exports last year compared to the 2016 campaign. Growth is also expected this year. New Zealand is also ready to ship to China. In January, China opened its borders to the islands and imports from New Zealand are only expected to increase. Meanwhile, investments are also being made in domestic cultivation. There has been a major shift over the last two years. The sale of ripened avocados is growing rapidly. Also, the first avocado ripening facilities were inaugurated last year in Shanghai. This year, a second ripening centre will start operating in the south of the country. Investments are also being made in domestic cultivation.